For the filling, place the butternut squash pieces into a large bowl, drizzle over two teaspoons of olive oil and stir to coat. Season, to taste, with a couple of pinches of salt and lots of freshly ground black pepper; stir again. Place the pieces of butternut squash into a roasting tray and roast in the oven for 18-20 minutes, or until tender. Meanwhile, add the onion slices to the bowl used to season the butternut squash. Drizzle over the remaining teaspoon of olive oil and stir to coat. Season, to taste, with salt and freshly ground black pepper. Once the butternut squash has roasted for 20 minutes, sprinkle over the onion slices and continue to roast for a further 10 minutes. Remove from the oven and set aside for five minutes, to cool. In a high-sided bowl, blend the warm vegetables to a thick, smooth purée using a hand-held blender. Set aside to cool for one hour. Once cooled, stir in the grated cheese and a little grated nutmeg. Season, to taste, with salt and freshly ground black pepper, then set aside until completely cool. Meanwhile, for the pasta, blend the flour and eggs in a food processor until the ingredients come together to form a dough. Continue to pulse for a further minute, removing the lid and turning the dough over every 15-20 seconds (CAUTION: keep hands well away from the sharp blade of the food processor). Turn the dough out onto a lightly floured surface and knead well for 10 minutes, pummelling and stretching the dough until it is smooth, stretchy and has a slight sheen. When the pasta dough has chilled, take the first portion and roll it out onto a lightly floured work surface to a 1mm thickness (about the thickness of a penny), dusting the dough with a light coating of flour if it starts to stick. You need the surface area of the rolled-out dough to yield 12 discs, each 8.5cm/3½in in diameter. Using an 8.5cm/3½in cookie cutter, mark 12 circles in the sheet of pasta dough without cutting through the dough. Repeat the rolling-out process with the second portion of pasta dough. Set aside carefully. Divide the cooled filling mixture in half and place one heaped teaspoon into the centre of each marked pasta disc. Brush the dough surrounding the filling with a little cold water. Once all of the discs have been filled, lift the second sheet of pasta dough and drape it over the first, carefully smoothing the pasta around the filling using your fingertips to remove any air bubbles and stick the moistened sheets of pasta together. Dust a baking tray with a little flour. Use the same cookie cutter to cut out the 12 ravioli; place each on the prepared baking tray. Set aside until needed. Repeat the process with the remaining pasta and filling mixture to make 12 more ravioli..
For the garnish, heat the olive oil in a small frying pan over a medium to high heat. Add the sage leaves and fry for 10-15 seconds, or until they look translucent. Remove from the pan using a slotted spoon and set aside to drain on kitchen paper. Return the pan to the heat and add the sun-dried tomatoes. Fry for 20-30 seconds, stirring well, until heated through. Remove from the heat and set aside on a separate plate. Carefully drain the ravioli in a colander and return to the saucepan. Stir in the sun-dried tomatoes and season, to taste, with salt and freshly ground black pepper. 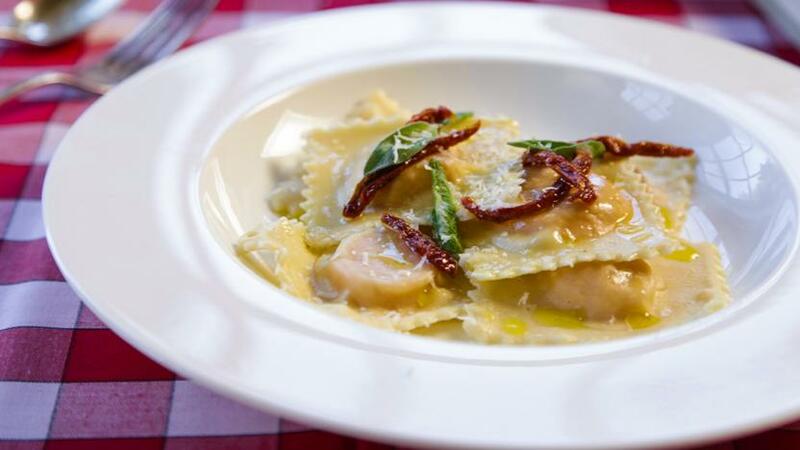 To serve, divide the ravioli among four warmed plates, spooning over any sun-dried tomatoes left in the saucepan. Garnish with the fried sage leaves and sprinkle over a little cheese. If you don’t feel very confident forming the ravioli all at once, divide the pasta into eight portions at the beginning and make the ravioli in batches of six instead.